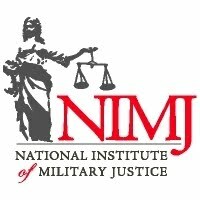 The National Institute of Military Justice (NIMJ) is a non-profit NGO dedicated to the fair administration of military justice and the advancement of public understanding of military law. NIMJ seeks to bring together academic interest and practical experience in military justice. One of the ways in which NIMJ has sought to recognize the growing interest in military justice and encourage further study of military legal issues is through awards that recognize excellence in military legal scholarship. These awards advertise to the broader legal community some of the most significant work being done by judge advocates and other practitioners, scholars, and students of military justice, military commissions, and the laws of war. Kevin J. Barry Award for Excellence in Military Legal Studies. This award honors an outstanding article published in a calendar year. It also honors an outstanding scholar and peerless advocate of reform: Kevin J. Barry, a founder and longtime director of NIMJ. Captain Barry retired from the Coast Guard after 25 years of service that included duty as an operations officer, navigator, trial and defense counsel, staff judge advocate, and trial and appellate judge. As a lawyer, scholar, citizen, and gentleman, Kevin Barry is a model for those who would improve military justice. The award carries a $250 prize and certificate. Articles published in an academic journal, law review, or similar forum during 2014 are eligible for that year’s award (including articles dated in an earlier year but which actually appear later; some law journals take so long to release their issues that an article dated 2014 might actually appear in 2015). This award is intended to recognize substantial scholarship and will be evaluated for “excellence in military legal studies,” with the winner selected by a committee of law professors and practitioners, keeping in mind NIMJ’s mission to improve public understanding of military justice. If no article is deemed appropriate for the award, the committee may elect not to make an award for that year. If more than one article is deemed worthy of recognition, the committee may honor such articles with honorable mentions. Copies of the winning and honorable articles will be posted on NIMJ’s website if permitted by the author.